Sample shown using EOLS typestyle. 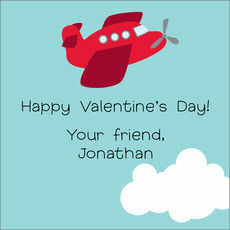 These airplane flat note cards are a great way to say thank you to your family and friends. Blank envelopes are included. Card size is approximately 5.5" x 4". You select typestyle to be used. Imprint is flat printed in ink color as shown. Printed return address available in flat black ink.